Walton Hall Gardens was originally part of a much larger estate purchased in 1812 by the Greenall family, famous for their success in the brewing industry. 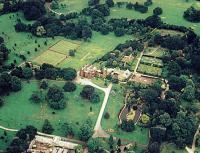 The estate was bought by Warrington Borough Council in 1941 and has been enjoyed as a park since 1945. With spacious lawns, picnic areas, play area, children's zoo, heritage centre and outdoor games it is the ideal place for a family day out. The mature parkland and ornamental gardens remain beautiful throughout the year, with trees and shrubs from all over the world. Home to much more than just our busy squirrels, you may be lucky enough to spot a weasel. More easily seen are woodland birds such as nuthatches, tree creepers and woodpeckers. Evening wildlife includes bats, foxes and owls. There has been a ranger service since 1983. The Estate Rangers patrol the parkland and Zoo Rangers care for the animals in the Zoo. The Rangers give information to the public, organise events, activities, guided walks, illustrated talks and provide an environmental education service on a variety of topics. One of the park's most popular attractions, the children's zoo boasts a colourful array of birds and animals. You can visit any day of the year and entry is free of charge. Christmas Day and New Years Day open from 10.30am to 12 noon only. Feeding time is 2.00pm in Summer and 1.00pm in winter. There are traditional games for everyone to enjoy. Test your golfing skills on our nine hole pitch 'n' putt course, have fun on the crazy golf or putting green or play bowls in the summer. Discount rates are available for groups of ten or more if booked in advance. From the North take the A56 out of Warrington, from the M56 exit at junction 11 following A56 towards Warrington. In both cases turn off at The Walton Arms. Monday to Saturday - from Warrington or Runcorn take the Arriva x30 or Halton Transport 62 to the Walton Arms. Sundays - Halton Transport c31 to the Walton Arms.